Communication begins with social interaction. So learning to play social games, such as peek-a-boo, is an excellent opportunity to support your child in learning to communicate. Not only are we targeting an early phase of social interaction and engagement, but peek-a-boo is a routine. Routines are activities that happen in almost the same way every time. For example, most mornings I wake-up, make coffee, get dressed and eat breakfast. This is my routine. The routines we engage our children in, like the game of peek-a-boo, introduce your child to turn-taking and eventually the skills needed for conversation. However, before a child learns to take turns during a routine, they need to hear and see the routine many times. The repetition will help them learn the actions, words, and sounds that go along with each step. Then when your child is familiar with the peek-a-boo routine, they will start to participate by taking a turn. Peek-a-boo is also what the Hanen Centre refers to as a people game. 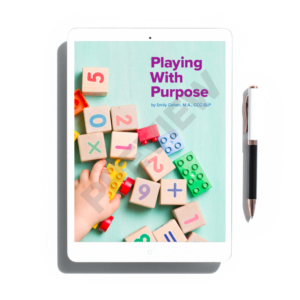 “People games are play-routines that involve just you and your child, without any toys.” And you already know, you are your child’s favorite toy. During peek-a-boo, he/she will love the surprise when you disappear and then reappear. The build-up of anticipation can be some of the most fun. What can your baby learn during Peek-a-Boo? Babies learn that people and objects are still present even when you can’t see them. This is called object permanence. 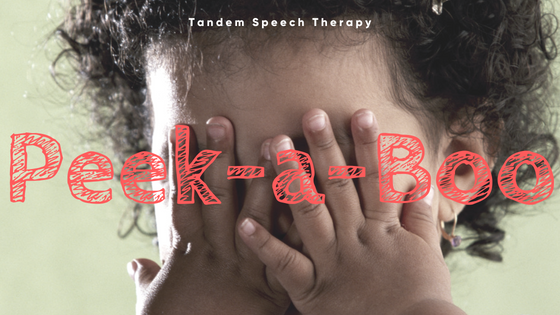 Peek-a-boo teaches all of the preverbal skills that are so important to speech and language development. Your baby will learn to maintain attention, imitate, take turns, play, gesture, and grow their understanding of language. The routine teaches babies to anticipate what might happen next by listening to your intonation and watching your fingers wiggle or a blanket shake before the excited “boo!” This teaches your baby that they can learn to predict outcomes of other social interactions as well. Start by getting down on the floor so that you are face-to-face with your child. Children learn by watching us. More specifically they learn communication skills like speech/words by watching your mouth. When you are face-to-face with your child they can see your mouth, they can view your body language and your facial expressions. You are also beginning to model good conversation behaviors that they will store and use later like eye contact and positioning. 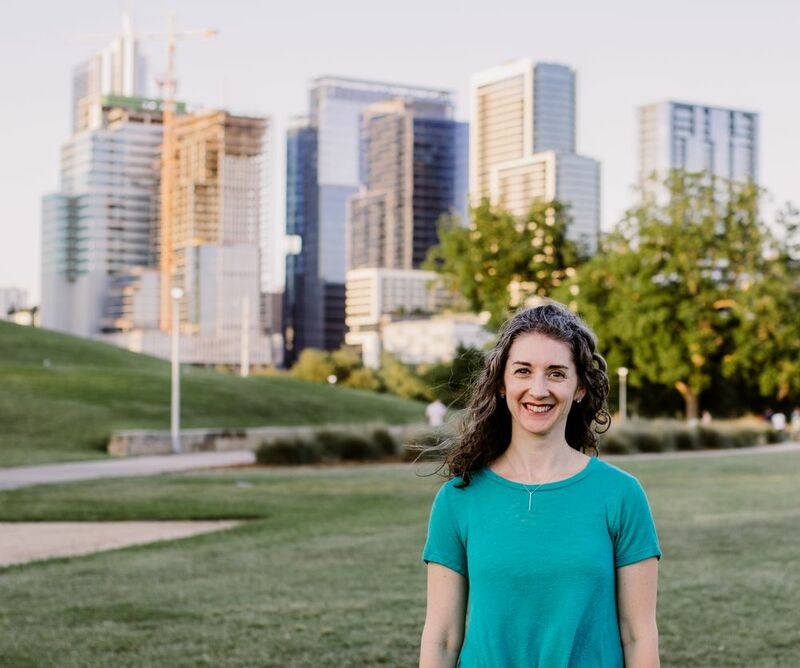 Next, hold up a blanket or towel and say, “let’s play peek-a-boo.” Put the towel over your head and ask, “Where’s Mommy?” It may be helpful to ask this questions a few times and build anticipation with your voice. Once you have played this game for a while, you will begin to see your child giggle or move in anticipation that you are going to remove the blanket. Then, quickly pull the blanket off your head, look directly into your child’s eyes and say, “boo!” Early on it is important to say only “boo” rather than ‘peek-a-boo.’ This simple sound combination of ‘b-oo’ is a word your little one is more likely to be able to imitate. Making this intentional word choice sets your child up for success. Imagine, they imitate you and say “boo” so you get very excited which reinforces this new speech. The more you reinforce the words your child uses, the more likely you are to hear them again! Want to learn more strategies to support your baby's development?